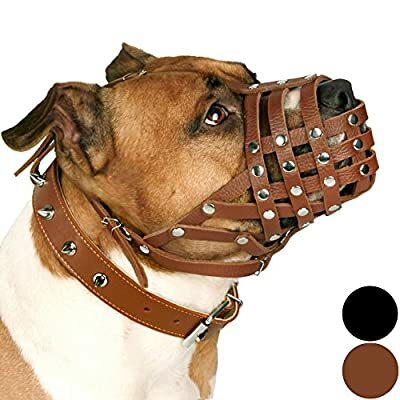 This handmade Dog Muzzle is intended for PitBull, AmStaff, Staffordshire terrier and other breeds with similar snout. Made out of genuine leather. This secure comfortable training muzzle has 2 adjustable straps. Please measure circumference and length of your dog's snout to confirm size. This handmade Dog Muzzle is intended for PitBull, AmStaff, Staffordshire terrier and other breeds with similar snout. Made out of genuine leather. This secure comfortable training muzzle has 2 adjustable straps. Please measure circumference and length of your dog's snout to confirm size. ?ircumference of dog's snout is 14". Length of dog's snout is 3".